Quickly choose your favorite cut of chicken, 4 portions please, because a zesty paprika-lemon marinade is on the way and you will want to make it it in the morning, before work, so that cooking dinner is a blissful event, rather than a chore. 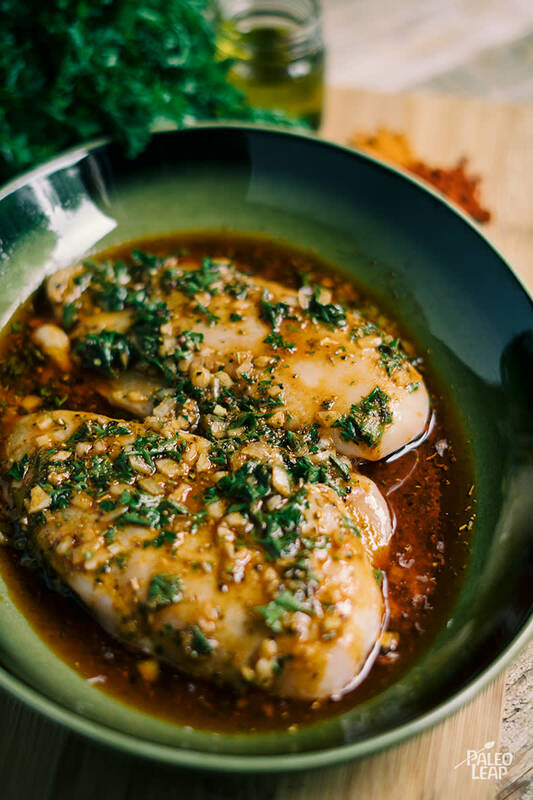 We’ll call this kid-approved as well, so long as there are enough drumsticks to go around, but let us also mention that thighs are exquisite when bathed in this flavorful marinade, as well as skinless chicken breasts – you really cannot go wrong. You could also squeeze a bit of leftover lime in there, should one be lingering around after last night’s dinner of spicy cilantro-lime tuna… Use what you have on hand, just don’t skimp on the zestiness of it all. When making a marinade, the length of marinating time really does matter. For poultry, 2 hours is the minimum amount of time for soaking, 4 hours is about average and 8 is certainly plenty. If the marinade is too acidic, it may toughen the meat, so learn from another tasty marinated chicken recipe and trust your cooking intuition. It is also good to know that the choice of baking, grilling or frying is up to you, so if you are stuck in a chicken rut, you can change your cooking methods and spices to keep meals captivating. Of course, the resourceful cook can bring any simple, sautéed vegetables to the table, but clever minds already know that an awaited chocolate cake for dessert is on order. In a bowl combine the olive oil, lemon juice, onion, herbs and spices; season to taste. Whisk until well mixed and pour over the chicken. Marinate in the refrigerator 2 to 8 hours, turning every few hours. Cook chicken to your preference or preheat grill to medium-high heat. Grill the chicken 5 to 6 minutes per side, depending on the cut, or until cooked through. Let the chicken rest 4 to 5 minutes before serving.